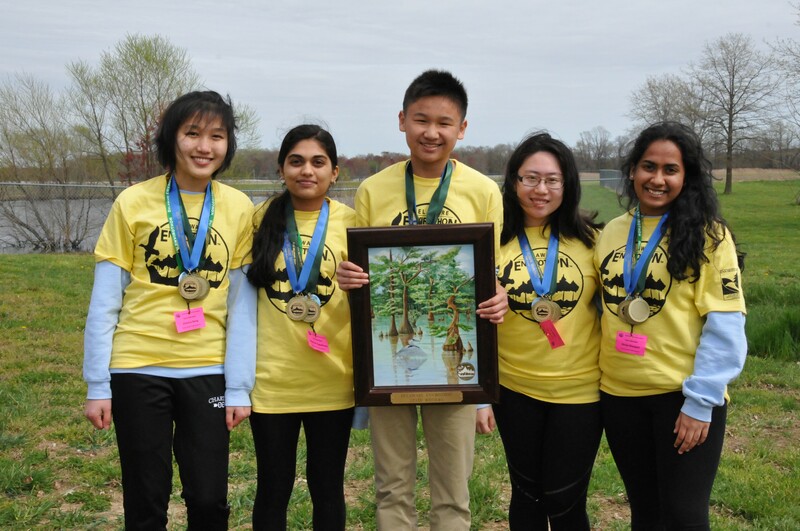 First Place in the 2019 Delaware Envirothon: Wilmington Team A, left to right: Victoria Deng, Udeerna Tippabhatla, Darren Wu, Shan Yu, and Shriya Boyapati. DNREC photo. DOVER – Charter School of Wilmington Team A is the winner of the 2019 Delaware Envirothon competition held April 11 at Delaware State University’s Outreach and Research Center near Smyrna. This is the school’s 20th win in the event’s 24-year history, including an unbroken winning streak since 2002. Charter School of Wilmington Team C finished second and Charter School of Wilmington Team B placed third in the Envirothon competition. The Envirothon is a Delaware Association of Conservation Districts (DACD) program with sponsorship and staff support from the Department of Natural Resources and Environmental Control. This year’s 17 competing Envirothon teams from eight high schools and one 4-H club statewide – Calvary Christian Academy, Charter School of Wilmington, Delaware Military Academy, Dover High School, Middletown High School, Newark Charter School, Polytech High School, Sussex Tech High School and Peach Blossom 4-H Club – worked hard all school year to prepare for the event.